Once of the order of Powers, Wall is a great and powerful duke, who commands 36 legions. He appears as a tall and terrible dromedary or as a human who speaks Egyptian. He knows of the past/present/future. Vuall is a great duke and a strong, he is seene as a great and terrible dromedarie, but in humane forme, he soundeth out in a base voice the AEgyptian toong. This man above all other procureth the especiall love of women, and knoweth things present, past, and to come, procuring the love of freends and foes, he was of the order of potestats, and governeth thirtie seven legions. 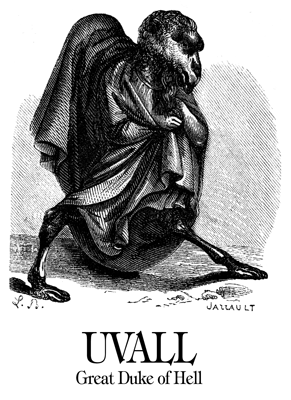 The Forty-seventh Spirit Uvall, or Vual, or Voval. He is a Duke, Great, Mighty, and Strong; and appeareth in the Form of a Mighty Dromedary at the first, but after a while at the Command of the Exorcist he putteth on Human Shape, and speaketh the Egyptian Tongue, but not perfectly. His Office is to procure the Love of Woman, and to tell Things Past, Present, and to Come. He also procureth Friendship between Friends and Foes. 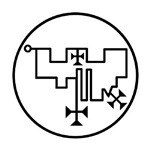 He was of the Order of Potestates or Powers. He governeth 37 Legions of Spirits, and his Seal is this, to be made and worn before thee, etc.